2018 Wairoa Extreme Race – 20TH YEAR ANNIVERSARY OF THE GREAT RACE! 20TH YEAR ANNIVERSARY OF THE GREAT RACE! The Wairoa Extreme Race is 20 Years old this year! So to celebrate 20 years of awesomeness, this year we have a Battle of the Legends Race! Previous Winners of the Wairoa Extreme are invited to battle in a race that will decide the greatest Wairoa racer of them all. Again we have the 2 day event with the Time-trial being held on Saturday 17th Feb and the Head 2 Head event on Sunday 18th Feb. Both count as separate events in the Extreme race national series. Categories: Open Men, Open Women, Junior Men and Battle of the Legends (previous winners only). REGISTRATION: Please register using the form and payment details in this post. Please Note: ONLINE REGISTRATION ONLY. There will be no NO ‘ON THE DAY’ REGO this year. Entries close on Thursday 15th Feb @ 9:00pm. Competitor Bib pickup 12:30pm @ Lake McLaren car park (100m further up road from McLaren Falls). Come sign the waiver, grab your bib and check you start time. Time-trial course – From Mclaren Falls Put-in to the bottom of rollercoaster rapid. Finish touch Banner on river left. (same finish as the boater X race). Bib Pickup 10:00am – 10:30am @ Lake McLaren car park, 100m further up road from McLaren Falls. Prize Giving: 4:30pm Bottom Wairoa take-out paddock. To take home the Wairoa Xrace Title you need to win the Head 2 Head competition, but National Series points are on offer for the Time trial as well – it is treated as a separate event. Your results there will then seed you into the head 2 head competition on the Sunday. 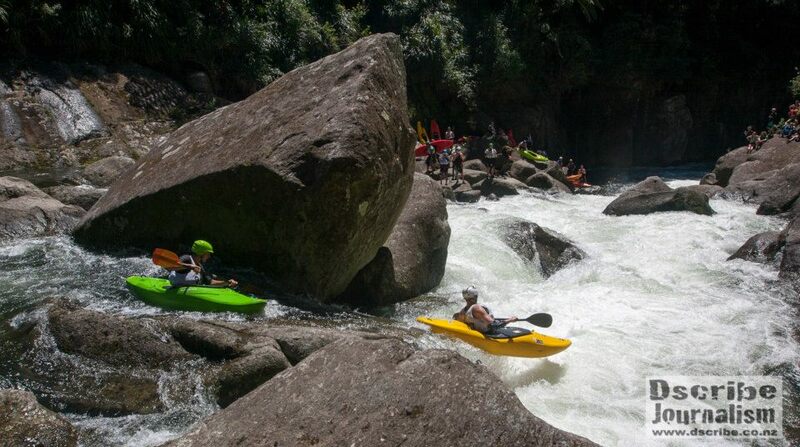 The Wairoa X race weekend plays its part as 2 races in the 5 race national series. Your best 3 results count towards your national ranking. Click the link below to see how the points are allocated. Most kayakers are already aware of Didymo and the procedures and precautions to take to prevent its spread as well as other aquatic pests. Be sure to ‘clean check and dry’ BEFORE coming to the Wairoa Extreme. Especially anyone coming up from the South Island rivers it is imperative that all gear is decontaminated before entering any North Island waterways. We may have some small scale decontamination facilities for your gear at the event if you are desperate.